After a few years behind the wheel in Japan, my good friend Eric is moving back to the US to try his hand at the Formula D game. He’s leaving Japan with a main sponsor in tow called KS International, which is an aero kit manufacturer based out of Hiroshima. 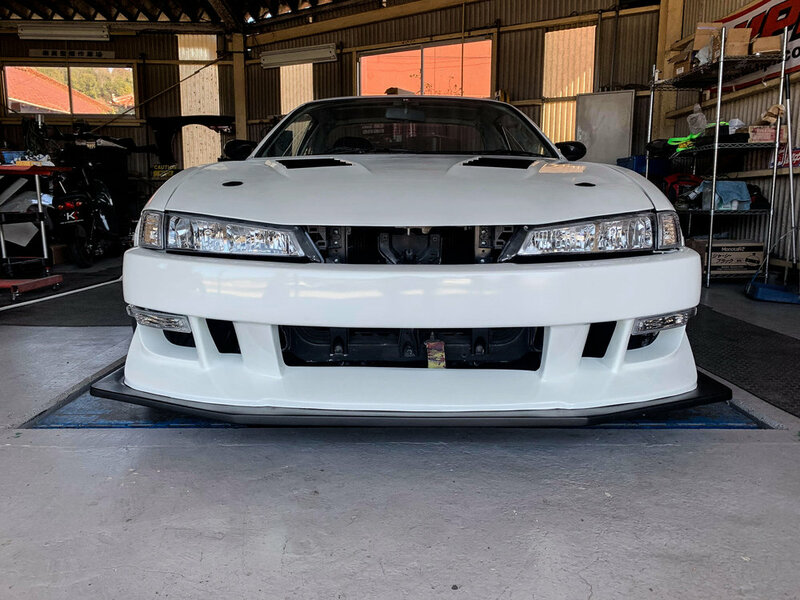 Eric recently made the trip to visit their owner, Akira Tukiyama, and check out the full S14 kit he had just finished. Suffice it to say, it’s a pretty wild kit. Giant over fenders and built in canards and diffusers give it a Time Attack look, but are intended for drift cars, like Eric’s US S14 being built by Hard Times outside of Chicago. The front bumper is fairly simple save for the massive built-in diffuser. The whole pin stripe along the bottom of the aero trend would make it much easier to see where the bottom of the diffuser is. At +70mm front and rear, the fenders are pretty damn massive. The NF370 wheels on the car are also part of the KS International lineup and Eric will be running them as well. The vents on the front fenders are easy to see from this angle and pretty unique. It’s nice seeing massive fenders like this that are complete panels and not just rivet on flares. On the side the diffusers are actually built into the skirts. The rear bumper is pretty nifty with valances that come down on either side. The spoiler is pretty subtle compared to the rest of the kit. Their Formula D Japan S15 runs their massive GT Wing, which would probably fit right in with the rest of this wild kit. Eric is going to be running the full kit, plus their door panels and trunk lid, which he’s pretty excited about. I’ve also convinced him to go with a mid-2000s D1 Grand Prix style graphic scheme so once his car is done it should look pretty impressive.